Our Transport of the Week is Corona! Doobert organization, StoryTeller’s Express Inc. was responsible for coordinating Corona’s travels to her new home. StoryTeller’s Expr ess, Inc. is a registered, not-for-profit (501C3) organization. The founder and president, Carolyn Parker, is a person who goes above and beyond to help animals. StoryTeller’s Express, Inc. provides assistance with transportation and is also a foster-based rescue. All transporters are volunteers who take time out of their busy lives and help homeless animals to get to their new homes. 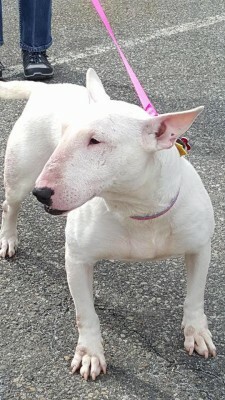 In early March, StoryTeller’s received a transport application for a Bull Terrier named Corona. She and her four roommates, another female bull terrier, a male Cane Corso and two, male Pit Bull’s, were turned in to the Smithtown Animal Shelter in New York on February 12th, 2016. The owner was being evicted and dumped all the dogs like trash, after neglecting them for their entire lives. These dogs were flea infested, had skin conditions, they were underweight with ribs showing, and pressure sores, some worse than others. Corona and her housemates lived their lives in filth and were kept in dirty crates, yearning for any human interaction. Corona and Rex (the other Bull Terrier) were used for breeding, but this mistreatment did not impact their character. All dogs received medical treatment, were spayed and neutered, HW tested, vaccinated, dewormed, and chipped. They have since blossomed and showed their sweet characters. 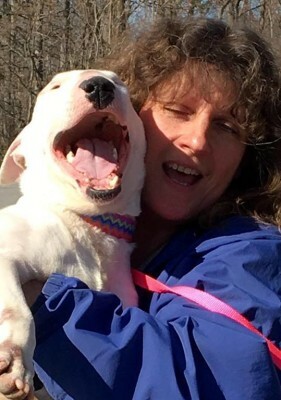 The Bull Terrier Rescue Club recommended Julie as well and gave a donation, which covered Coronas adoption fee. StoryTeller’s posted the run on March 13th, to Doobert.com, as well as on Facebook and her run filled within 24 hours. Thanks to the seven volunteers that delivered Corona to her new home. Corona was described as a loving, well behaved, and sweet dog, who likes to give kisses. All volunteers fell in love with her and said that she is definitely a keeper. Her pictures show she was a loving and happy traveler, and I am pretty sure she knew who her new mom is when she met her. Julie said Corona’s smile is priceless and she is settling in well, loves her new home, and loves her new siblings. She is easy-going and does not seem to have any problems adjusting! Learn more about StoryTeller’s Express, Inc. here, http://www.storytellersexpressinc.com. I helped with one leg. What a sweet, loving dog! So happy for her.